Lee Wai Chi, Yeung Wing (from left 2). Yip Man Wing Chun is the self-defensive Kung fu of attack and defense practiced by most people in the current society. 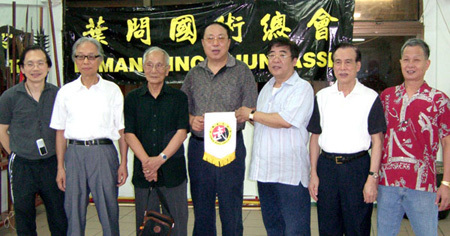 Among the Wing Chun prentices, more than ninety-five percent are from Yip Man's Faction. Wing Chun is also the Chinese Kung fu with most foreign prentices. China is one of the world civilized ancient countries with a resplendent culture of five thousand years. In order to enhance the national power, besides social prosperity and technological development, China as a great power shall meanwhile intensively and extensively promote cultural and traditional techniques in different fields, so as to foster friendliness and admiration of foreigners to Chinese, which is a great help for diplomacy and feelings of foreigners to Chinese. Fortifying and promoting culture is an investment which will carry an everlasting benefit to the country. When the attractive culture infiltrates into somewhere of the heart, it will bring positive reaction and resonance, and therefore the local people will appreciate and be willing to promote it, which is very favorable for the country in many terms. Among different traditional techniques, Kung fu, which especially represents the long-standing cultural foundation of China, can take permanent, infinite and profound effects. Kung fu represents healthy bodies and a technique of bare handed attack and defense. This is the cultural quintessence of a unique gymnastics. In fact, the culture of Chinese Kung fu has infiltrated into different places around the world. Traditional martial art of different styles has been spread all over the world, especially Wing Chun, which receives the most attention. Now millions of foreigners all over the world are practicing Wing Chun. They come from afar and live on a frugal life just for the purpose of mastering a good Kung Fu technique. Wing Chun is one of the most popular Chinese Kung fu in the world at present, especially because it can strengthen bodies with superior abilities of attack and defense. Up to now, many departments of military, police and security in foreign countries regard it as a "secret weapon". Wing Chun originated from Shaolin and Master Yip Man went to Hong Kong in the 1950s' with this special technique. After continuous improvement, a large majority of Wing Chun enthusiasts at present are the offspring of Master Yip Man. However, due to the difference in techniques of many coaches, many prentices just make up the number with different types of strange techniques. There are not many prentices who can practice genuine and good Kung fu. They even consider what they practice is genuine. Actually, it is a waste of money and time. What dispirits them most is that they follow several coaches but each coach has different technique. Due to the big difference in technique, prentices are uncertain which one they should follow. They can finally create their own distorted Wing Chun to give prominence to themselves. Later they name the Kung fu with their names or countries. The culture of Wing Chun will be plagiarized by foreigners and becomes the culture of foreigners ultimately. Some even try to register it in the United Nations as their heritage. In order to maintain and enhance this unique and excellent culture of Kung fu, all Chinese shall stand up. 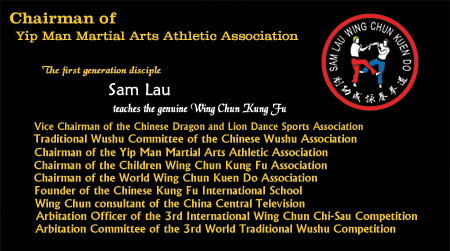 It requires admitting talents with genuine martial art, and collecting suggestions and advices from folk people who have practical experience of Wing Chun and boxing so as to integrate Yip Man Wing Chun all over the world. Unified standard shall be set up, and classification and ranking systems shall be adopted in test so as to enable prentices to positively make progress and improve overall techniques, and meanwhile to turn it into the most effective and powerful empty-handed device. Therefore all Wing Chun enthusiasts in the world have genuine technique to follow, to believe and to normalize. Primary and middle school students not only can practice karate or taekwondo,they also have another alternative -- Wing Chun. Leaders of our country all mention to protect and develop Chinese traditional culture on different occasions, therefore, I suggest that General Administration of Sport of China shall adopt effective measures to protect and develop this excellent culture. I believe Wing Chun may become a sport in the Olympic Games someday in the future if we promote it seriously, because Wing Chun is actually a sport practiced by many foreigners. I believe all enthusiastic Chinese have responsibility to support and develop it.